An update already? Yes, we’re not sitting on our hands here at REDVOLUTION HQ you know, we’ve got strippers to meet the brains out of and berets to sew and sell – and more importantly start again looking after the people who’ll be warming our squares of plastic after we vacate them at the Valley – hence item 6 on the revised manifesto below relating to the saucepans' own Charlton supporters club. I’ll add that, following Frankie & Miss Kish recent writings on what the new fans forum can do, this latest point is for you guys to get your teeth into. Disbanding and reforming the womens team may have been a publicised PR nightmare but when the club decided to stop Junior Reds a couple of years ago it went by largely unnoticed. But now is the time to act – get the Junior Reds back up and running (hell I’m even in the job market if the club want an experienced piss head – sorry, administrative manager to do it for them). Like Whitney I think we should use our long standing position as a leader in the youth stakes to our advantage. That means more to follow Grant Basey, Josh Wright and Jonjo Shelvey into the first team and for my kids and yours to be able to belong to the club we all love from an early age as many before them have – even I was in the junior supporters club (or whatever they called it then) many moons ago. JOIN THE REDVOLUTION – for the sake of the kids!!! I didn't know the Junior Reds had gone. It that's true it's scandalous. Having said that I signed up my son on his birth, but didn't bother renewing, so I guess I'm as much to blame as anyone. The fee was, from memory, £15 a season. I would have made it free, and allowed applicants to apply online and then receive an id pass and news letters for ever. Well until they reach 16 or 18 anyway. I mean it's marketing aimed at those that won't be able to tell, yet have the ability to extract their parents money with ease - my son does. Fine with most of this, but item 5? Are you mad? you can still visit the website which was last updated in ... 2006 !!! Mind you my dad thought Jorge Costa was one of our best ever - must check my fmily tree for portugese routes - Arrrrrrriba!!! 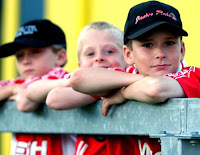 Junior Reds went in 2006 and is now part of the red card scheme. Shame, although I believe the kids football teams still exist and thrive.